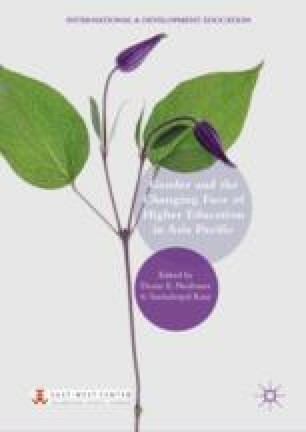 This chapter examines women’s representation in the leadership positions at key world-class research universities in the Asia Pacific region. It engages with documentary research into the case studies of various Asian flagship universities, namely National Taiwan University, Peking University, Seoul National University, the University of Hong Kong, and the University of Tokyo. The documentary research is based on an in-depth review of the academic literature comprising empirical studies which investigate and explain the representation of women academics and their involvement in intellectual leadership at Asia Pacific higher education institutions. Special attention is paid to the significant factors that structure female engagement in leadership roles. The determinants that either facilitate or impede the women’s representation in academe and senior managerial positions are reviewed to make sense of the empirical findings of this study. The findings indicate that the University of Hong Kong (HKU) has the highest representation of women leaders (28.9%) who are mainly from non-STEM backgrounds and are also most prevalent at the departmental level. HKU has also, among the five case-study universities, higher representation of female institutional leaders (14.3%). Another East Asian world-class university which has made better progress in gender equality and university management is National Taiwan University (24.6%). For working toward inclusivity of intellectual leadership in the East Asian academic profession, there needs to be more culturally sensitive and gender-appropriate policies and practices in the human resource management in universities, which are sensitive to the personal and professional lives, including marriage and family obligations (Tang 2017). The inclusion of more women professors in leadership positions can serve as much-needed role models for mentoring young female academics. Through better gender-informed and humanistic implementation of human resources management, women’s credentials and their various capabilities and caliber can be capitalized upon with a view to enabling more inclusive and robust future transformations of East Asian world-class universities and the academic profession. The author would like to thank Mr. Chi-fung Wilton Chau for his valuable research for this chapter.